I wasn’t going to post this until Monday, but now it really is the companion piece to the garlic infused olive oil recipe I posted this morning. So here you go– and for those of you who aren’t crazy about this much garlic, or think it’s going to be overpowering, the end result when you infuse it oil is more of just a hint of earthiness. It doesn’t really taste so much like garlic, it is just a whisper, a savory bass note that gives dishes a little warmth. 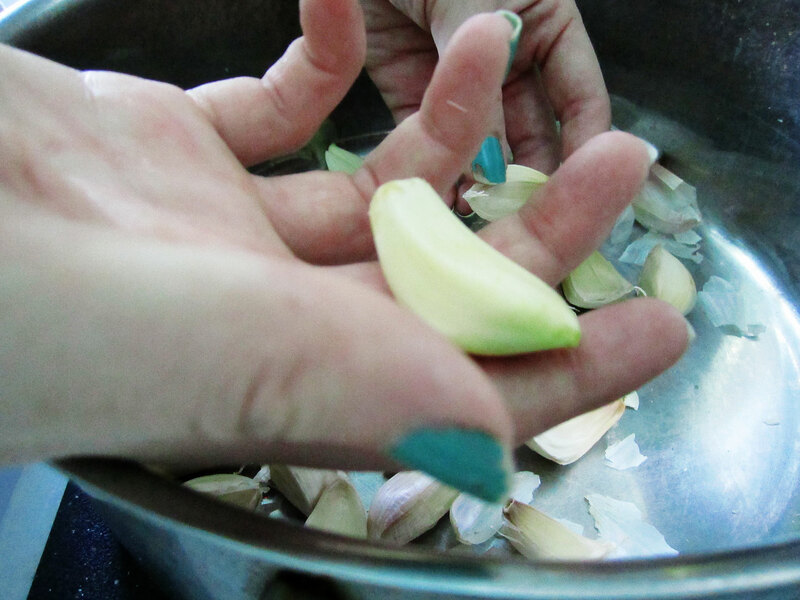 Before you can infuse your garlic olive oil, though, you need to peel a boat load of garlic. Which sounds daunting, but I’m going to show you how to do it in thirty-seven seconds. I only use the method at home when I need to peel a ton of garlic, as it does leave you with an extra dish to wash. In a restaurant where you have the luxury of a professional dishwasher, we don’t care so much about dirtying an extra dish. But that’s a whole other subject. Place the garlic heads on a cutting board or sturdy counter top. 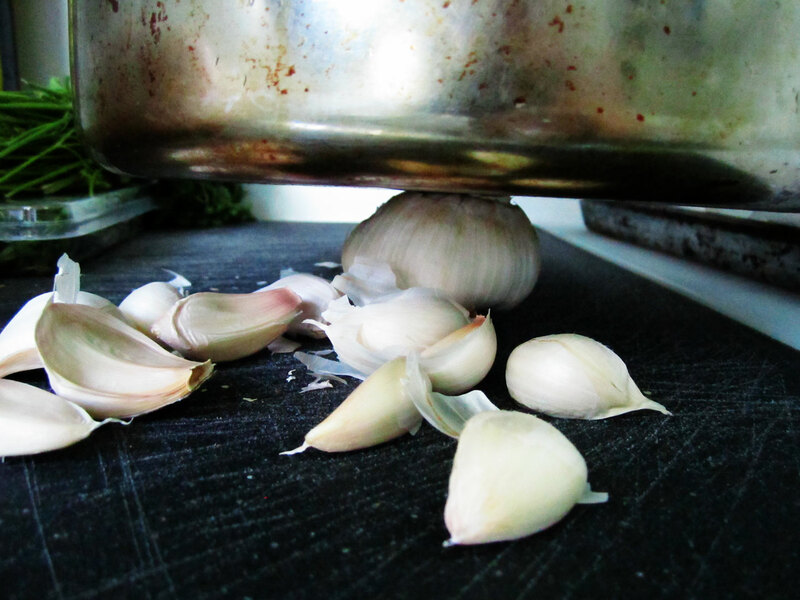 Smash the heads of garlic with the pot to break the individual cloves apart (NOTE: don’t smash too exuberantly, or cloves will jump off your counter top and roll under your oven). Press the cloves a couple more times with the bottom of the pot, just until the skins have started to crack open, but not enough to squish the cloves. Toss the cloves in the pot, cover with the lid. SHAKE THE BE-JEEZUS OUT OF THE POT. Really get those cloves rolling around and knocking into each other, bounce ’em off the lid; it should sound like popping corn for the thirty seven seconds you’re shaking. 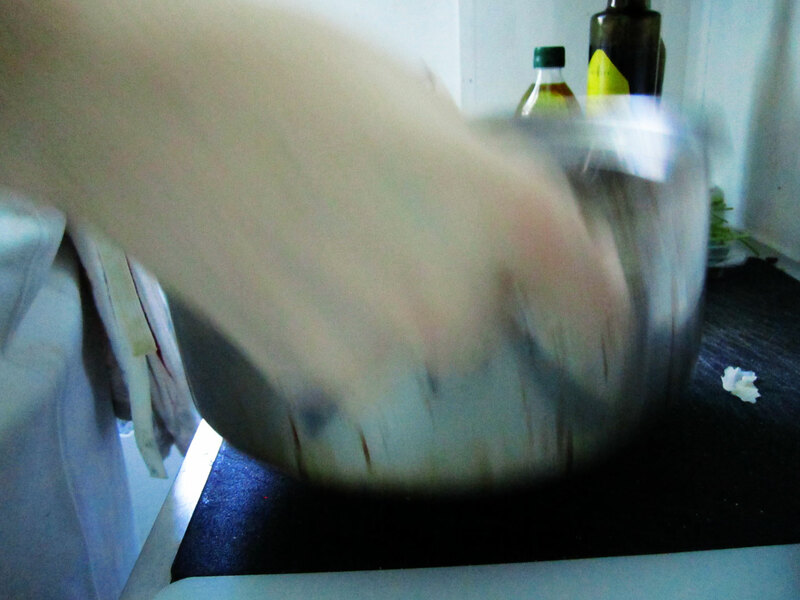 Remove the lid of the pot, and notice how your cloves have slipped out of their skins. If they haven’t all shed their skins, shake ’em some more.